Related Posts: Nepal’s Annapurna Circuit – Is It Still Worth Doing? When it comes to hiking and trekking, nothing comes close to Nepal! Age-old trails going up the various valleys of the Himalayas, the crossing of an occasional 5000-meter high pass, and the nearby presence of one or two of the fifty highest mountain peaks in the world – Nepal has it all. Add to the mix a well-developed trekker infrastructure and deep-rooted cultural groups with their Hindu and Buddhist rituals and architecture and you have the ingredients of an experience few if any other places can offer. I was last in Nepal in 2006. Over a two-month period that autumn I walked the Annapurna Circuit trail and spent three weeks in the Everest region on the Three Passes trek, which to my mind is the #1 long-distance trek in the world. As 2016 approached I was looking forward to a return visit and another great hike – but then the earthquakes of 2015 shook the country so my plans were put on hold. Well, here we are three years later and I am finally set to return. I fly to Kathmandu via Abu Dhabi in early April. But where to go? I wanted to walk new trails and honed in on the two following possibilities, one in the Annapurna region and the other just east of it with Manaslu, the world’s eighth-highest mountain as the focal point. The plan was to organize it on my own using the itineraries of established trekking agencies as a guideline. (Click on the above links to see sample itineraries.) I planned on hiring a porter to carry the bulk of my gear while I dealt with a daypack. Both routes require special permits and a minimum of two trekkers accompanied by a guide. I went so far as to get a copy of the Cicerone Trekking Guide to Manaslu and The Tsum Valley by Siân Pritchard-Jones and Bob Gibbons and spent some time reading relevant threads at the Trip Advisor’s Nepal forum. I even registered at the Trekking Partners website and posted a proposed itinerary and flexible dates. However, November was probably much too early to be looking for a partner for an April or May trip! All but one or two responses were from independent trekking guides looking for work! See here for a copy of sections of the book in Google Books! A trail much less travelled – but, as the write-up makes clear, also one I was not going to be doing on my own! It would also involve tenting since there is no teahouse infrastructure along most of the route (i.e. from Tsarang to Koto). Special permits to enter Mustang – an initial $500. U.S. for ten days – would be required. Along with the tents, add to the list a three-week supply of food and basic mountaineering equipment to deal with the glacier traverse. 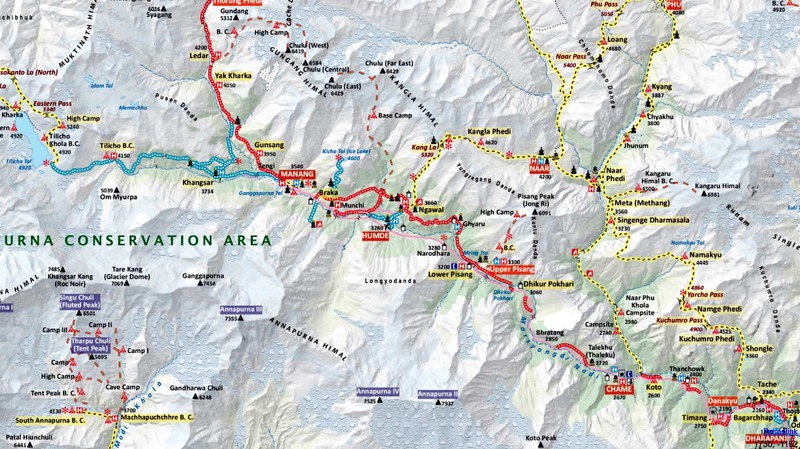 This online map of Upper Mustang – hard copies available at the Himalayan Map House store in Kathmandu) – lays out the route from Jomsom on the bottom left up the Kali Gandaki to Tsarang and then east to the valley below Saribung La on the middle right. 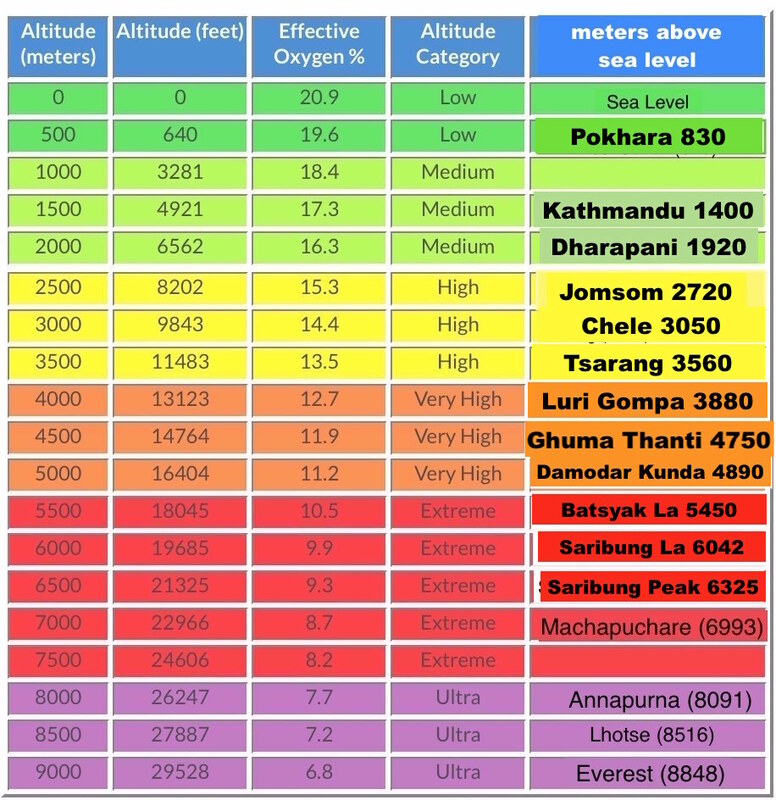 Phu and Meta and Koto and the Annapurna Trail are a bit further south! More googling led me to this trek organized by the respected Australian adventure travel agency World Expeditions. I gulped when I saw the price – $5395. CDN! Ouch! However, two internal flights are included ($250. U.S.), as are the $650. U.S. for the Mustang entry permit and another $200.+ for the three nights at the five-star Kathmandu Radisson. Also included is the use of a down sleeping bag and down jacket as well as an insulated mat. I went over their itinerary and other info. All in all, it looked pretty good! I put the WE offer to the side while I looked for other trekking agencies which had something similar. I found trips organized by two U.K. agencies. KE Adventure Travel, the first one, has one called Saribung Peak and the Damodar Himal Reconnaissance. It includes a walk up the 30º snow slope from Saribung La up to the peak. Jagged Globe, has a trip with the less pretentious title Saribung Peak and Upper Mustang. In both cases, the trip cost was higher than the World Expeditions offer, due in part to the Saribung Peak climbing fee. As well, they both include a day or more in Lo Manthang, something not included in the World Expeditions itinerary. The WE route only goes as far as Tsarang before turning east to Luri Gompa and Damodar Kund, which I did think was unfortunate. To be so close to Lo Manthang and yet not visit? I also checked out some Lonely Planet and Rough Guide-recommended Nepali trekking agencies based in Kathmandu but not much was coming up and, in all cases, I was the only client and I was the one responsible for getting other people to join to make the trip possible! To enter Mustang, you need a trekking agency and a minimum of two trekkers along with a guide. A porter is optional. A few days later I visited the World Expeditions site again. The price had dropped to Cdn $4950.! It was late November – perhaps it was a Black Friday sale? I made a phone call to their Ottawa office to see how many had already signed up. The answer: four. Still not a sure “Go” (six is the official minimum) but probably a “Go” if I signed up. It uploads a flashy web page to attract my attention! it provides a comprehensive information package on pre-trip planning and requirements. Its use of the same agency over the years indicates that certain standards of safety and food and all-around competence are presumably being met and reinforced with training sessions for the guides. The trekking crew’s experience in handling high-altitude expeditions, up to and including summits of Mount Everest, was reassuring. While the Mustang – Saribung Traverse is hardly in that elevation class, it still involves crossing the 6040-meter pass at Saribung La after a couple of nights of tenting at 5000 + meters. Knowing that the crew has been there before is comforting! Update- late February! Oops! I got the name of the agency wrong! It is Highland Excursion(s) and not Highland Expeditions which will be handling the trek! That feeling of reassurance I mentioned above? I am not feeling it quite so strongly now! If you were to judge the two agencies solely by their websites, then Highland Excursions is clearly not in the same league as Highland Expeditions. Arranging pilgrimages via plane and jeep connections to Muktinath and Mount Kailash seems to be its primary focus. Its Nepal Trekking folder is very thin on actual high-altitude camping treks. The sub-header on the home page – One of the leading adventure travel company – has a glaring grammatical error and could use the qualifier Nepal’s as in “One of Nepal’s leading adventure companies” to make it sound a bit more plausible. As I scroll down the page, seeing the heading “Popular Destination For 2014” in 2018 does not show great attention to detail! Now I am hoping that World Expeditions knows something that this website is not conveying! A website is one thing; the trekking agency crew of guide and sirdar and cooks and porters on the ground is another. Reviews of this and other WE trips in Nepal are overwhelmingly positive. As always, time will tell. Stay tuned for the trip report! Update: The on-the-ground crew – 20 of them, all from the Tamang community except for the lead guide and overall leader with a Rai cultural background. 100% competent and always ready to make things easier for you. Ten porters, a cook team, a couple of sherpas, a sirdar…at times, as an independent do-and-carry-it-yourself camper at heart – I was embarrassed that so many people were looking after me. One negative was the fact that only one of them – the guide and overall leader – spoke English. He was often at the very end of the long string of crew and trekkers on the trail. Our trek begins in Jomsom, the administrative capital of Mustang at 2720 meters. On Day 1 we meet the trekking crew and walk up to Kagbeni along the Kali Gandaki River, which we will ascend all the way to Tsarang over a four-day period. Then it is east across what is a high-altitude desert towards Damodar Kund. 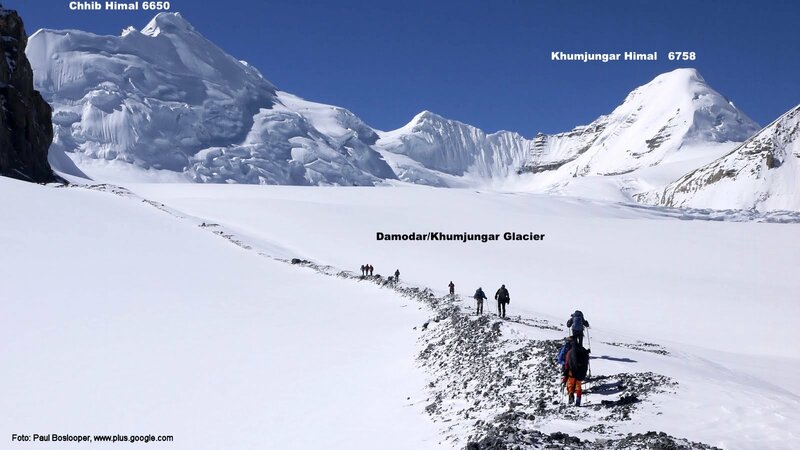 We have twelve days to acclimatize as we walk up the Khumjungar Glacier on our approach to the trek’s high point at Saribung La. See here for the full itinerary. The route can be seen in this Wikiloc upload from November 2016 upload by Aymami. The only difference will be that ours does not include a visit up to Lo Manthang, some 13 kilometers north of Charang. Just click on the image to access the GPS track. Instead of the walk up to Lo Manthang, our itinerary has a rest day in Charang scheduled for that day. From Charang (also spelled Tsarang) we head east across the Kali Gandaki towards Yara and on to Damodar Kund following the Hindu pilgrims’ trail. While acclimatization problems have not impacted on any of my mountain trips so far, it is a potential issue that I am always aware of. The ascent schedule arrived at by the trekking agency, which says it has done this trek before without any problems, is a “plus.” As a point of comparison, Kilimanjaro is 5895m and many agencies offer six or seven-day treks up the summit and back down. Little wonder that many do not make it or feel pretty lousy when they do. Our trek schedule provides much more time to acclimatize. Update: I created the above graph using elevations from the World Expeditions trip notes. A number of those figures are incorrect. 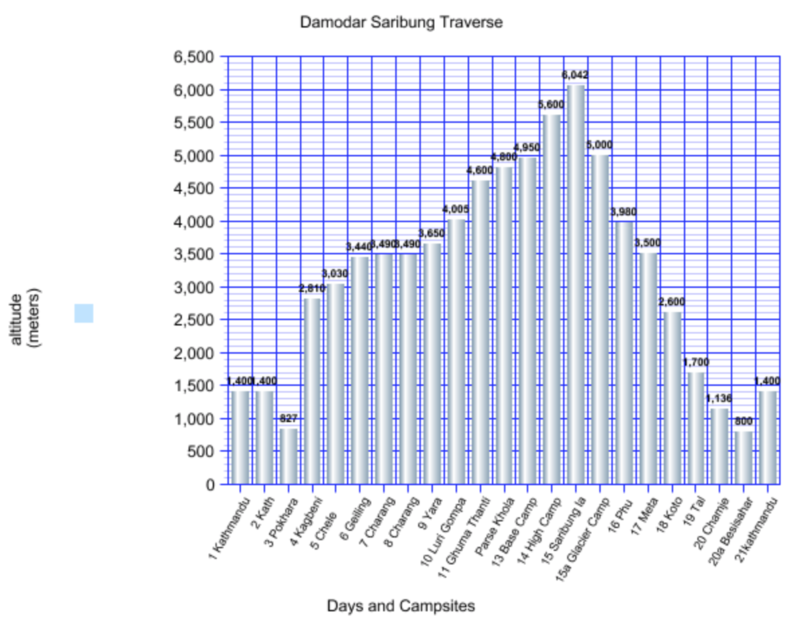 See the posts for each day for the actual campsite elevations! To ease my adaptation to the thinner air, I also had my travel clinic doctor write me a prescription for acetazolamide (known by brand name Diamox); it speeds up the acclimatization process. It does not mean you can ignore the usual acclimatization protocol! Update: Four of five of the trekkers made use of the Diamox as a prophylactic. I did a 250 mg tablet each day (half on getting up and the other half at supper ) from Pokhara to the day we crossed Saribung La. There were no side effects other than the copious peeing. That pee bottle for in-tent use at 3 a.m.was an essential piece of kit! I have another seven weeks to go before departure. Since I get to Week 12 of the plan in mid-March, I’ll just repeat and gradually increase the workload of the program’s last week when I get there. Of the 60 sessions so far, I have missed two. I hope to keep up that commitment level until the very last day of training – April 8! Update: The Uphill Athlete program has changed the way I think about preparing for mountain trips. Too bad it happened when I was 66 instead of 46! For my next trek – maybe the Snowman in Bhutan – I will repeat the 16-week plan I followed for this trip. On my last mountain trip in September of 2014 – a two-week trek down Bolivia’s Cordillera Real – I got food poisoning the day before the trek began! This time I will absolutely avoid the obvious things you should avoid – including the green leaf salad I had at that La Paz restaurant! This time I will take a treatment of Dukoral; it is a non-prescription oral vaccine which helps prevent diarrhea caused by E.coli. Some hand sanitizer and my Steripen – a device which purifies water by emitting UV rays – will also come along to eliminate other possible dangers. Since all the food will be prepared by the cook crew, I will assume that they’ve got it all figured out! So too with the daily three liters of water that we will be consuming to stay hydrated. Azithromycin in case of severe diarrhea. I hope I don’t have to use them! Update: Acclimatization was not an issue though I did experience a bit of puffiness under my left eye. No gastrointestinal issues at all! Maybe it was the Dukoral? Top marks to the cook crew for their obsession with keeping things clean! The last consideration is the gear. Having been on enough of these mountain trips and being a bit gear-obsessed, I have amassed more clothing and other gear than I need! My -15ºC Western Mountaineering sleeping bag will come along. I just need to give it a wash before I go; it has been a few canoe trips since it last was cleaned. Also coming along is the WM Hot Sac VBL, a vapour barrier liner that helps prevent the down from getting wet from body vapour in sub-zero temperatures. As we go up beyond 4500 meters, over-night temperatures will be in the -10ºC range. A frozen water – or pee – bottle in the morning will be a sure thing! Update: In the end, I left my sleeping bag and vapour barrier at home. I made use of the “free” sleeping bag provided by the trekking agency. It was fine, even if twice as bulky as my WM bag. Also provided was a fleece sleeping bag liner but I left it behind in Kathmandu and wore my Polartec fleece top and bottom in the bag instead. In October of 2006, I flew Air Canada from Toronto to Delhi via Zürich and then, after overnighting in a downtown Delhi hotel, returned to the airport for the flight to Kathmandu. On my doctor’s recommendation, I also took malaria medication (a week’s treatment!) as a precaution for my twelve hours in Delhi! That experience left me determined never again to subject myself to a half-day of the pandemonium of Delhi’s airport and roads. Instead, I fly from Toronto to Abu Dhabi and then, after a three-hour wait, get on the flight to Kathmandu. Total travel time from YYZ to KTM – 19 hours, almost half the time I was in transit in 2006. Of course, time will tell if this year’s itinerary actually unfolds without any bumps! Update: I would definitely fly Etihad again! It made getting to Kathmandu a breeze. All four flights were on time, food was okay for airline food, and while the economy seats were a bit cramped, they are on any airline! Abu Dhabi is a nicer airport to spent time in than New Delhi’s Gandhi. And I was spared the overnight in Delhi. 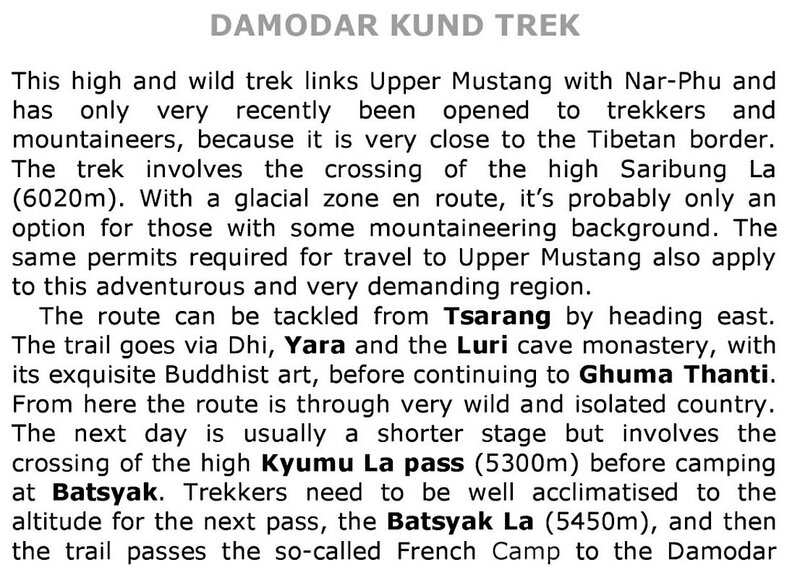 Mustang/Damodar Kund As A Classroom! Other than obsessing about gear, the other thing I overdo is finding out as much as possible beforehand about the place I am going to. Geology, environment, history, anthropology, religion, politics – it may be the school teacher in me that turns entering Mustang to entering a classroom! Since I signed up for the trek I have also learned that one of our tent spots is by Damodar Kund (kund is a small lake or pond); it is a Hindu pilgrimage site associated with the god Vishnu (aka Narayan). Reading up on the Phu Valley has made clear that I am entering a very special and isolated nook of the Tibetan Buddhist world. Going with some basic knowledge will mean that the questions I ask are not the obvious ones to which I can find the answers in a Wikipedia article! Nothing like a 90-minute Stair Master session at the gym to create some spare time to view videos! Already done is the six-hour Michael Palin BBC series on the Himalaya. I have also watched the 2015 movie Everest, a retelling of the events of the May 1996 climbing season described in Jon Krakauer’s classic Into Thin Air. Also watched was Eric Valli’s Himalaya from 2000, which was filmed in the upper Dolpo region to the west of Mustang. Not specific to Mustang but still a great way to forget that I am walking on a treadmill set at the maximum incline with a 12-kilogram pack on my back for almost two hours is the Joe Simpson epic Touching The Void. Here are a few more of the videos I have looked at over the past few weeks to get a grip on various aspects of Mustang (pronounced Moose dung!). They all really bring home how little I know about this corner of our world – and how lucky I am to be able to spend some time there this April! Stay tuned for a recap of my trek when I get back in May. Until then, it is back to my training and continuing education program. Not even mentioned in all of this is the fact that I get to spend five days – three before the trek and two after – in the most fascinating city I have ever visited – Kathmandu! I will try to visit the half-dozen UNESCO World Heritage sites located in the valley and see how they fared in the 2015 earthquakes. Below is a photo (the labelling is mine!) of the approach to Saribung La, the literal high point of the trek! Check out Paul Boslooper‘s image collection for an excellent visual summary! Who needs to go anywhere anymore – it is already all online! This entry was posted in hiking/trekking, mountaineering, Nepal. Bookmark the permalink. Yeah – busy getting ready! I’m looking forward to this, having already bought the plane ticket in December!